Last week's break from blogging was just what I needed, but it's great to be back! I spent a lot of time chasing after my speedy 8 month old, who's new favorite activity includes crawling in between the various furniture blockades that I set up around our house. He's a sneaky one, I tell ya. Nicholas and I out to dinner. He LOVES being in the highchair, as if you couldn't tell. I was also able to spend some time praying about the direction of this here little blog. Though God is still shaping things, I'm excited about a few new features that will be coming to Life of a Pint-Sized Mama. And in order to give all that I can to my family and friends, and to this blog, I will be posting a little less frequently - but I feel that will enhance the quality of each post. I hope and pray that this space on the internet will encourage and bless you! Also, yesterday was my blog's half birthday! (It's weird to call it a half birthday, I know.) Life of a Pint-Sized Mama began February 19, as an idea that popped into my head during a sleep-deprived early morning feeding. 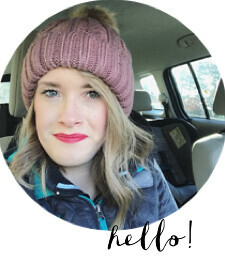 My heart was to share about the unique life I live as a 4'8" tall mama; I'm so happy that the Lord has allowed this blog to become even more than that. Thank you for coming along this journey with me! I have learned a ton through this experience, and met some amazing people. Thanks God for the unexpected blessing that blogging has been. This is what happens to you when you're 4 feet 8 inches and you have a completely normal sized baby. Most people, including myself and my husband, thought there was no way that my belly could possibly grow anymore, but it did! The photo on the right was taken at 37.5 weeks and Nicholas didn't come until 39.5 weeks. So my alien belly was even bigger than in these photos. I am kind of glad there is not documentation of that. You know that whole fishbowl theory, when they say that a baby will only grow as big as there mom is? Wrong. I am the proof. I hope you enjoyed seeing my ginormous preggo belly. I am linking up with you from Melissa's blog, I look forward to keeping up with your blog. You were so cute pregnant! You have the MOST adorable son, too! Stopping by from the GFC Hop! Loving your blog. Say hello to your newest follower from Texas! I'm so excited to read more from you. My belly did the same thing when I was that far along.. Just stuck out there like no one's business! Love it! i LOVE preggo belly pics!found u thru the GFC follower hop at naptime review and now follow thru GFC! New GFC follower from the gFC blog hop. Hope you can come by for a visit at http://Menopausalmother.blogspot.com Thanks! !